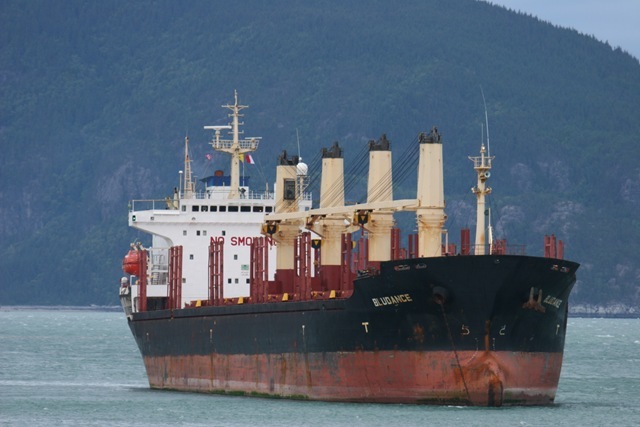 The Bludance anchors in Port Chilkoot. What’s up? After the men of note practice, a large merchant ship (550 ft long and 85 ft wide), the Bludance, home ported in Malta, pulled into the shelter of Port Chilkoot and dropped her anchor then swung around into the wind. She sits there now, looking rather conspicuous, if I do say so. I’ve never seen any ship like her in these waters. I googled her and wound up with a link to Jane’s Merchant ships that requires a purchase. She’s sitting very high in the water and is hanging off her starboard anchor, as can be seen in the photos. Needless to say, I’m quite curious what she’s doing here in these waters empty, as she is. It’s tempting to hail her on the VHF and ask what she’s doing, but I’ll probably resist the temptation. It’s quite windy in the canal today and a number of fishing vessels elected not to head out to Boat Harbor this evening. Perhaps she’s needing to get out of the wind for some reason. 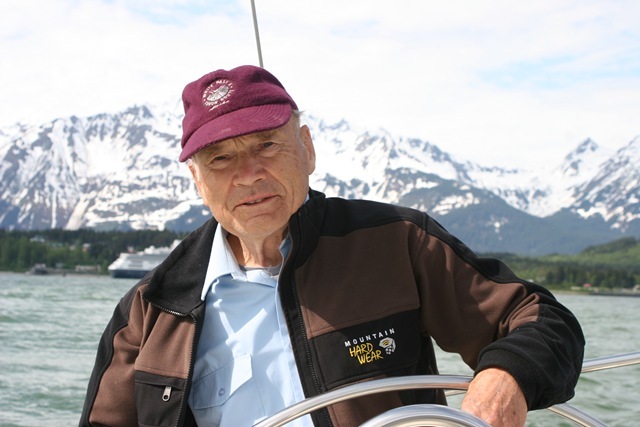 Bob and Margaret returned from Juneau today aboard the Greta with John! It was sure great to see John again. They made the trip from Juneau over two days, anchoring up inside Mab Island last night and continuing on this morning. Bob and Margaret aren’t prone to anchor up in unfamiliar spots, so it was nice that John was there to show them our favorite spot to anchor during the fishing season. There was a very stiff south breeze blowing them along so they used the engine for only about 20 minutes or so on the trip home. John looks about the same, it seems. I suppose if one looks closely, he’s a bit older, but so is everyone else, self included. 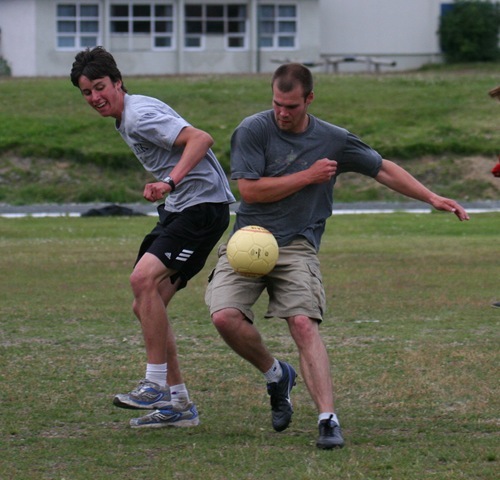 In the photo, he’s playing the local young folks in a friendly game of soccer. Jack did the purchase on the soccer shoes that he’s sporting as he keeps the ball away from Chandler Kemp. I was on the Windbreaker with the mechanic that is going to install the new engine when they pulled into their slip. When I went to tie them up, the dingy was in the way and its rope was blocking the cleat, so I flubbed it and she rammed the dock. The boys were sure happy to see him and play a little ball with him. Of course Holly and John had a great time yapping about all sorts of things and I shoed him my Motion Computing LE1600 tablet PC and the cool stuff one can do with Art Rage 2.5. He had a difficult time believing that I did the painting of Chandler, but that’s to be expected. He’s been reading a book called Micro trends that seems like it would be worth reading. Margaret fixed a wonderful meal for us and we had a nice celebratory repast. Then the Men of Note rehearsed for the Saturday State Fair performance which will be at 2 PM. A Sailing We Will Go! Bob called early this morning and asked if we wanted to go sailing! The plan was to take the boys in the morning, so we settled on gathering at the boat at 10 AM sharp. The Greta is a 35′ fiberglass sailboat that Bob & Margaret (My In-Laws) have owned for as long as I’ve known them. 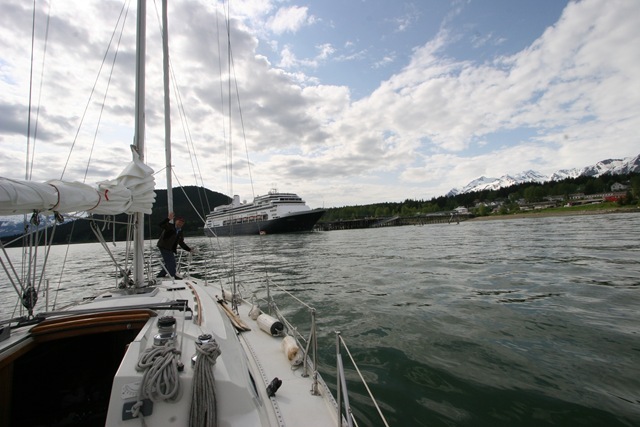 The came to Alaska aboard her and toured SE Alaska until the decided to settle at the Senior Village in Haines. Back before we had the boys, when bob was trying to go sailing once a month, he’d often bring me along to help man the lines or to steer while he set the sails. The Greta (short for Margaret) is in immaculate condition, as Bob is quite faithful about polishing the hull each year and also varnishing the teak when it’s time. 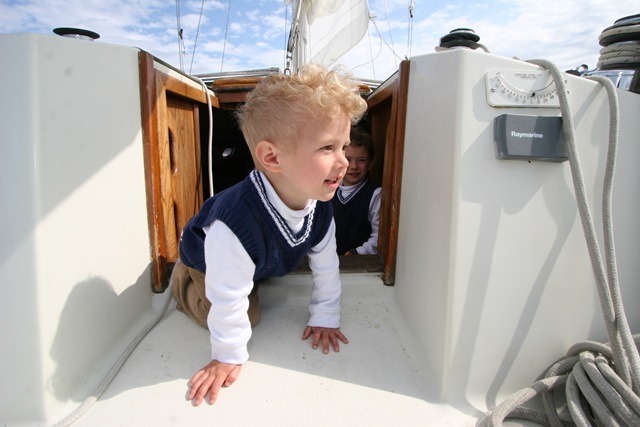 Boats are great places to learn tons about the weather, physics, water, wind, and life in general. Plus they’re great places crawl around and explore. Margaret fed the boys peanut butter and jelly sandwiches down in the galley while Bob set the main sail to the second reef as we headed out of the harbor. There were quite a few whitecaps on the water just out past the protection of Port Seward. 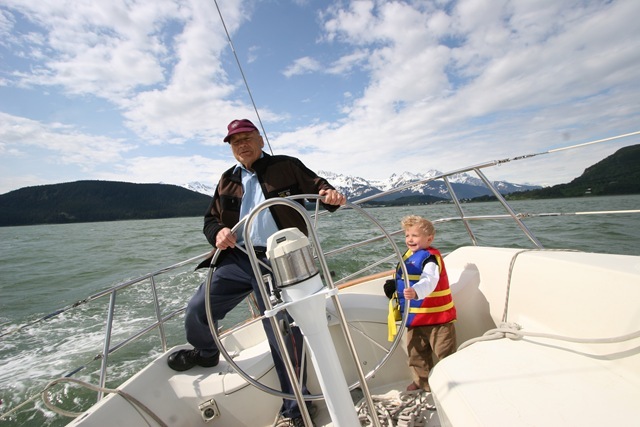 As a matter of fact, one of the reasons the Pluckers decided to stay in Haines when they were casting about for a home all those years ago, is that a decent sail is to be had just minutes out of the small boat harbor. In the picture below, it looks like Bob was doing all the work. But in reality, it was Bob at the wheel, me taking pictures, and Margaret on kid duty. You do the math. Both Luke and Mark got a brief chance at the wheel before it got a little to windy for fun and we headed back in to the harbor. Basically we made a straight shot for Skagway, then came about into the wind and headed back home the way we came. Distance one equals distance two. It was slightly overcast/scattered clouds when he called this morning, and we had three adults for three kids. Lea mi blog en español! Lire mon blog en français! Matt’s blog in italiano: Leggere ora!